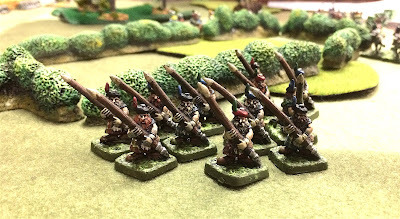 A few years ago, I painted my 15mm Battleore figures to make armies for Dragon Rampant. I've been playing it a bit again and thus I picked up a few more figures. 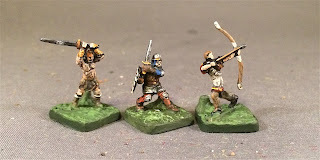 These fellows are from a couple of Battle of Westerros expansions and seem suitable for a Borderlands kind of army. I have a few more batched (mounted and foot) that I am working on. 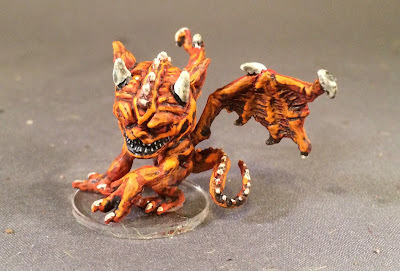 I tried to match the painting and basing with the stuff I did a few years ago. 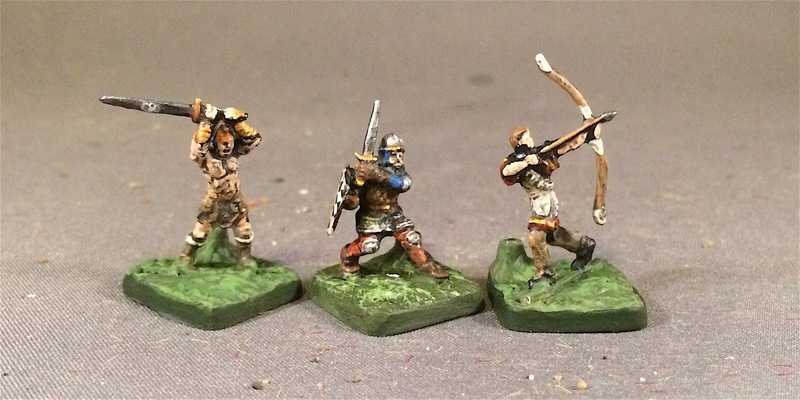 They more of less fit in with the Battlelore stuff (centre figure below). Up next: Probably more of these guys! 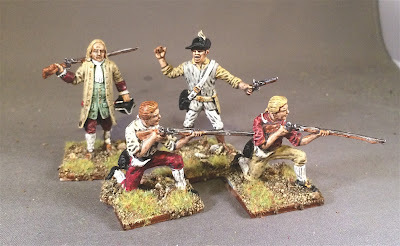 I finished a mixed bag of miniatures this week. First up were two command bases of Reaper goblins to supplement my goblin armies for Dragon Rampant. 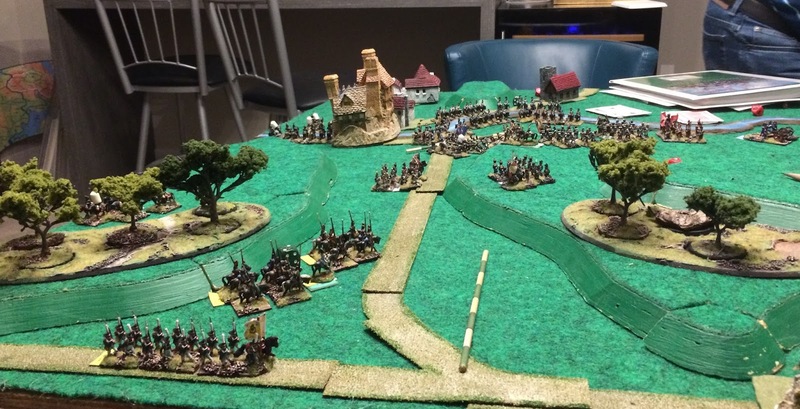 Most of my troops are from Battlelore 1st Edition (so 15mm-ish). I bought some metal minis (right below) to create command stands and I tried to base them to match. They are a touch big but good enough (leaders are likely bigger anyhow). 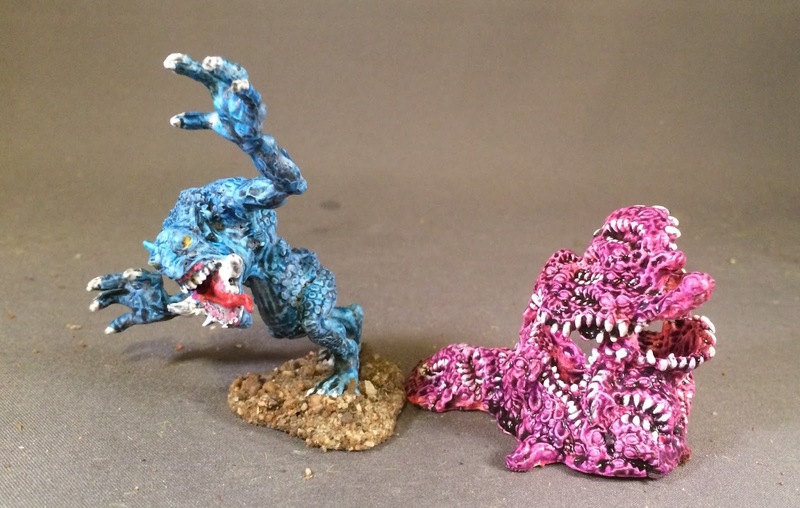 I also finished off two random 28mm Reaper monsters I got in a trade. 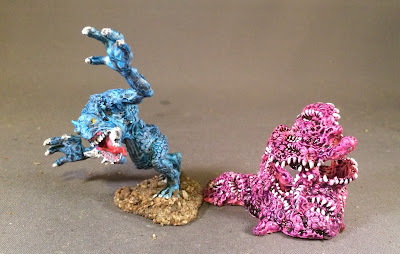 The pink thing has a lot of teeth and would work for Pulp Alley. Finally, I finished the last two units of 54mm AWI militia. We have the white-greys below. Followed by the rust-buffs. Now not the cannons! Up next: I have turned my attentions back to some more 15mm fantasy using some Battle of Westerros figures to create a borderlands army. I finally had to turn on comment moderation due to a pernicious spammer. I will try to be on top of approving comments. Sorry about this unfortunate turn of events. Bruce and I gave Fate of Nations another go prior to him bringing it out to the club next week. 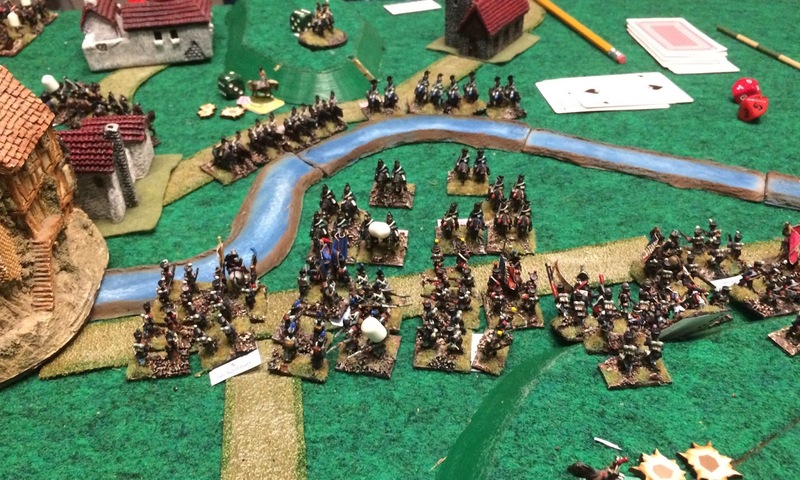 This scenario was a pretty typical advance on a defended hill. 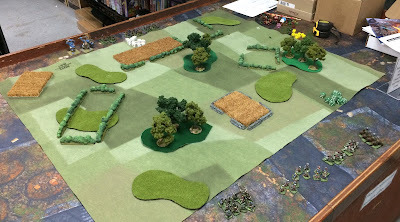 We each played about three commands and my advance suffered due to my inability to keep everything quite straight. I managed to dislodge Bruce from the main farmstead and even knocked out a command on the left (but could not capitalize). 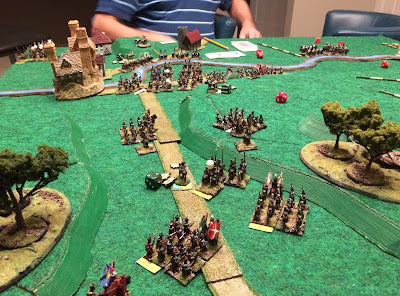 The right flank was more of a grind (traffic problems). In the end, I conceded that I likely couldn't win in the turns left. 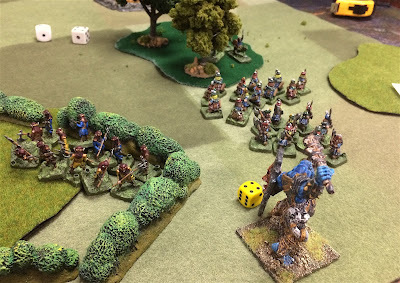 We liked around slightly tweaking the morale rules to reduce the resilience of the units (lots were at death's door but just kept passing morale tests when charged). Not sure how a -1 modifier per hit might ripple through the rest of the game. Perhaps the guys will find out on Tuesday? Up next: Hard to say. 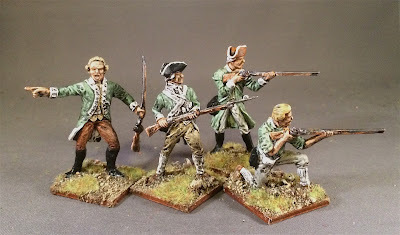 End of the 54mm militia and maybe some monsters? I had a pretty productive week painting. 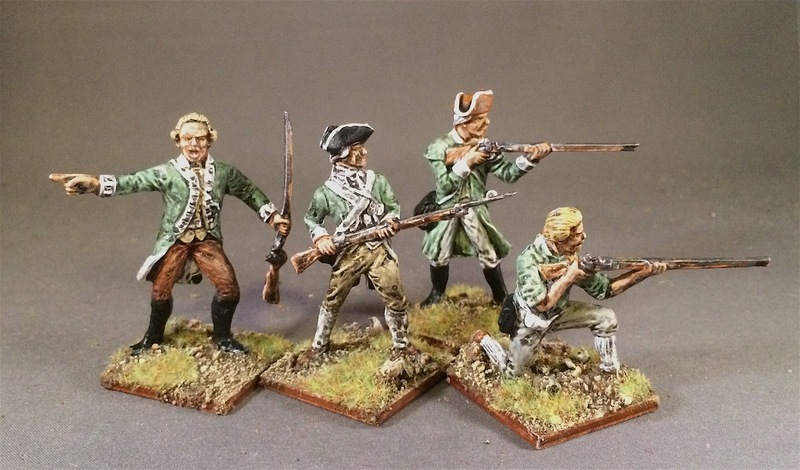 I finished another 8 of the 54mm AWI militia I have been working on. Above the buff-whites; below the white-mints. 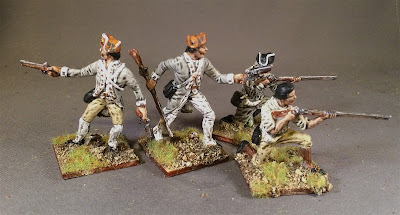 Only eight more militia to go! I also did some work on some 28mm Reaper figures I got in a holiday trade. 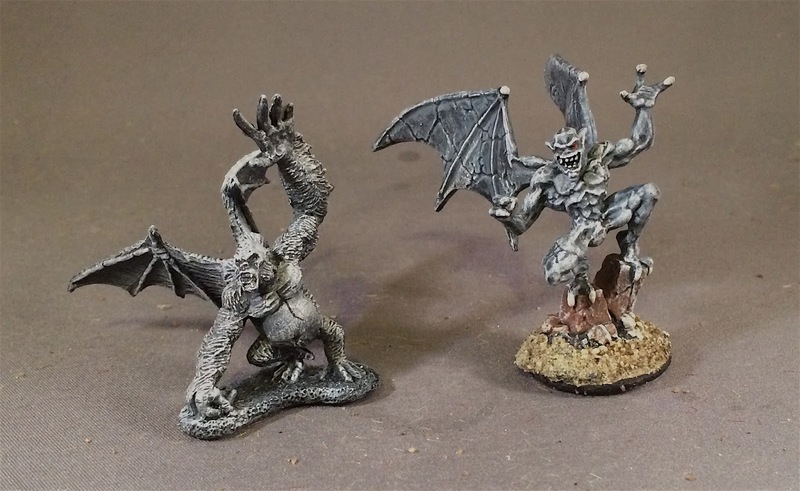 A flying ape and a flying demon bot got a bit of TLC to improve their paint jobs. Up next: More militia plus some goblins. 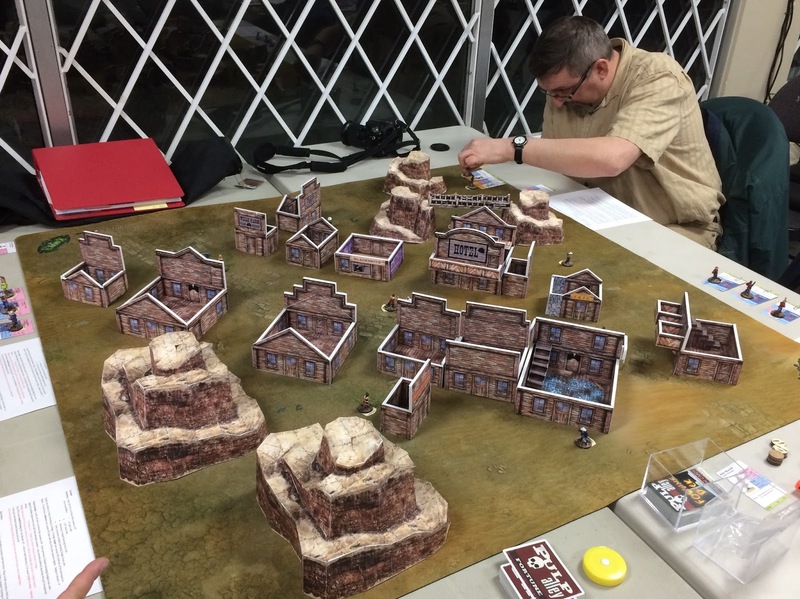 Tuesday was club night and we had there games running. Chen and Scott played some Dropfleet Commander. 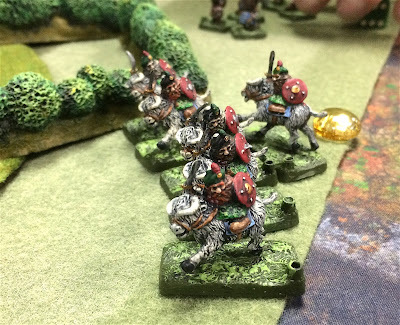 The minis were impressive, but not as impressive as Scott's cursing! 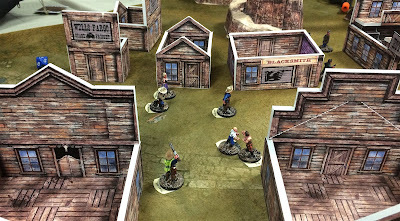 Bruce hosted some Pulp Alley using his wild-west set up with Terry and Richard playing. 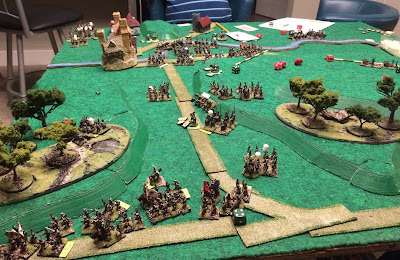 I ran of game of Dragon Rampant using one 15mm-ish Battledore troops. 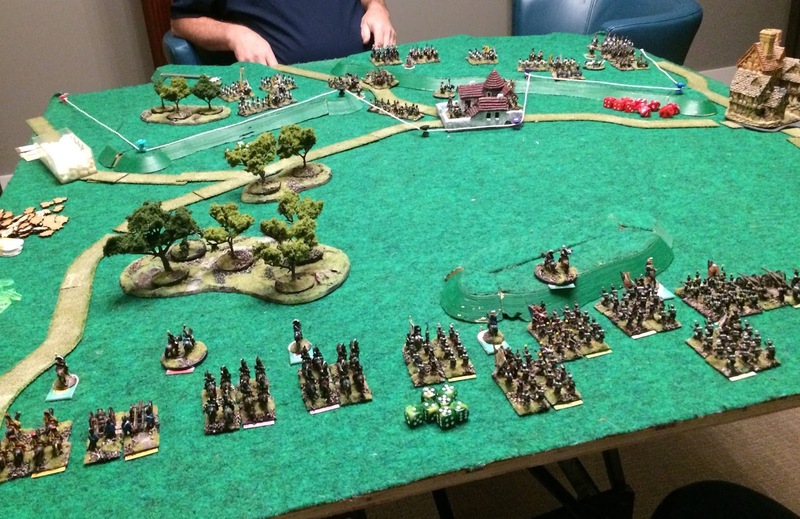 The scenario was "run like hell" where one side must move troops from the lefts side of the table to the right, while being ambushed from the top and bottom. The table set-up was simple. 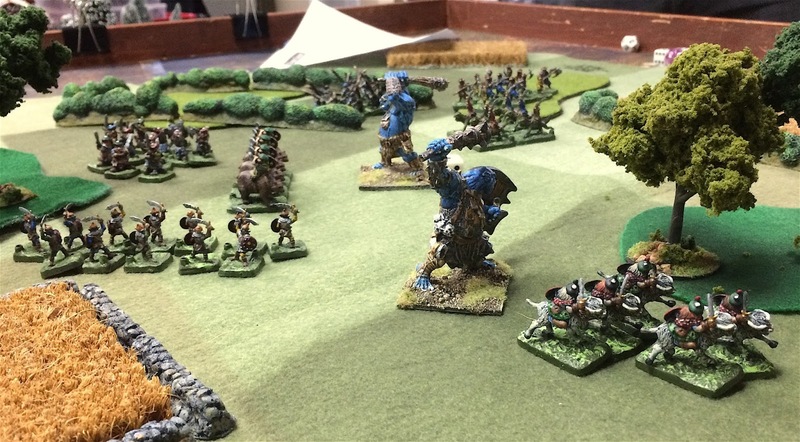 ...and meet some hungry trolls and their goblin allies. 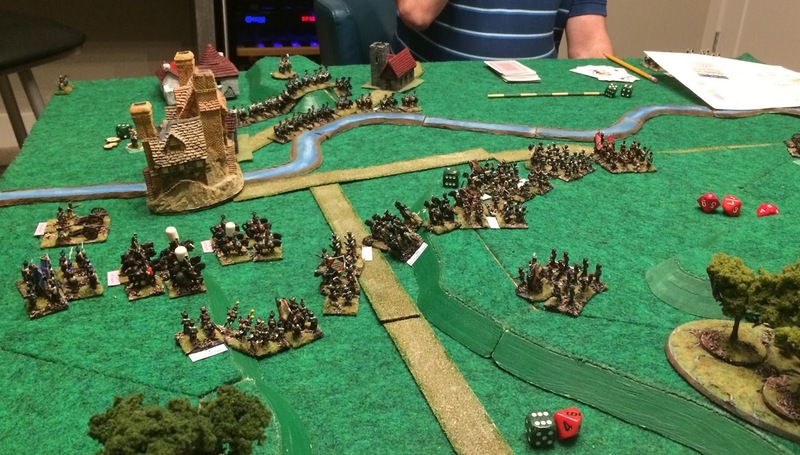 A crazy melee ensued with trolls chasing cavalry and things looking super bad for the dwarves. 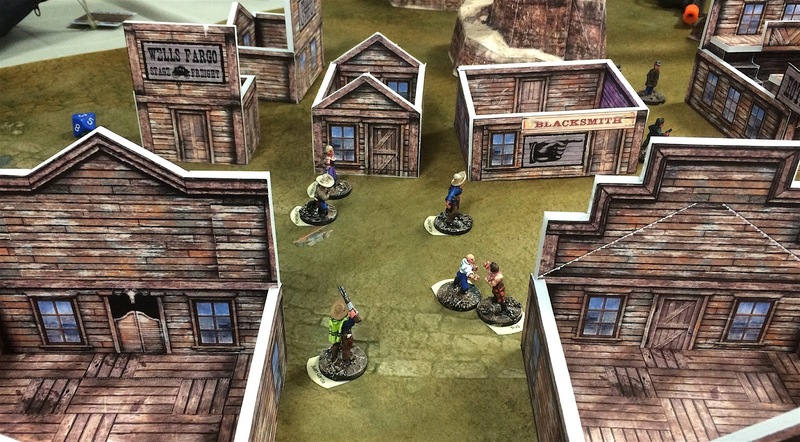 Then the dice came around it was an even game. A bad move by the dwarves saw a unit of pike pop while attacking into the woods. 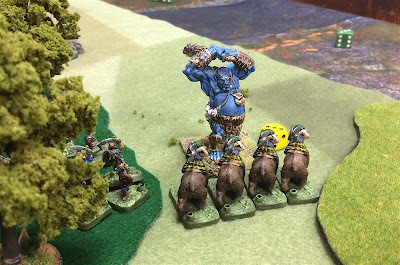 Eventually, the troll was able to grind down the dwarf crossbowmen and that was that. 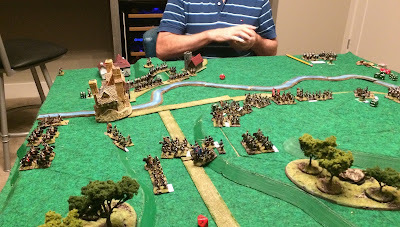 We switched sides and against the dwarves had a tough go. 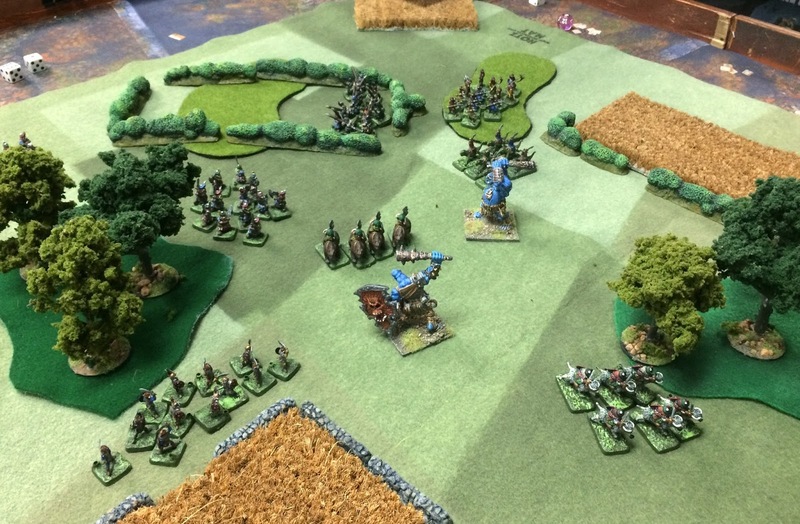 The goblins greased two units on the north side of the board: some cattle and some spears. The dwarves then began pushing the southern edge, hoping to even things up while the goblins got re-organized and manoeuvred. Here, some tough bear cavalry pushes hard against a troll, who would eventually run. 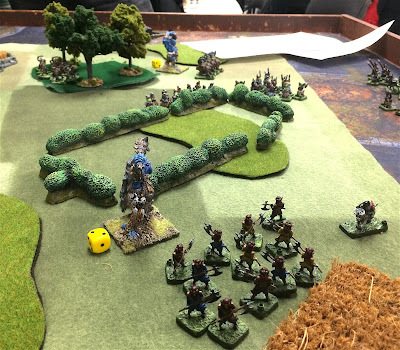 A grinding war of attrition eventually saw a retreating group of goblin fanatics as the last unit on the table as some dwarves spectacularly failed a command roll and fled. That gave me a few minutes to watch some cowboy action. 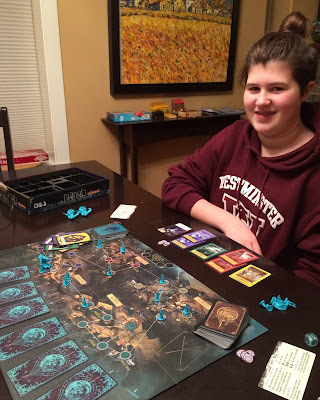 Back home, Jess and I played two games of Pandemic: Reign of Cthulhu. I finished a collection of Lovecraft stories last week so was keen to see how the game incorporated the thematic elements. We had one sharp loss (total nightmare) and then barely won the second game. 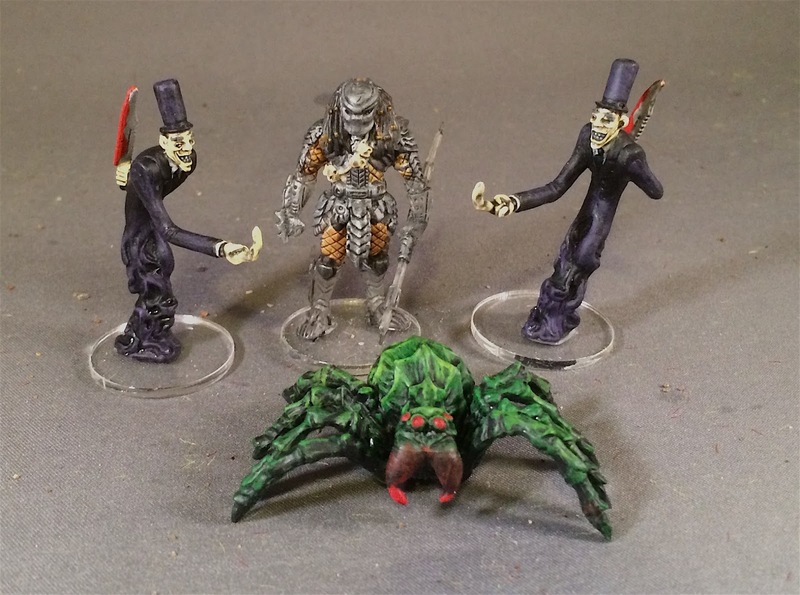 An order of bases finally arrived a few weeks back and I finished off some 28mm Horrorclix repaints I did over the Christmas holidays. These three demons are sweet little sculpts with insanely nice detail totally lost by the lousy Horrorclix paint job. I highlighted and washed and they really turned out well. 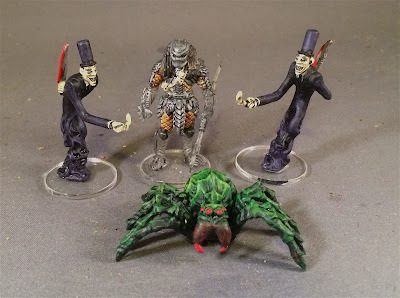 I also painted up a bunch of other 28mm Horrorclix. Some villains, some adventurers. Not sure how they will be used but nice to have then finished and available. I also picked up some Buffy not-Lego figures. Below there is Cordellia, Willow, Xander and Oz. I also bought Angel, Giles, Buffy and Spike. Nice enough--shame the red plastic so blows out the colour balance on my camera. Up next: Likely some more 54mm AWI fellows (coming to the end of the militia--just like Washington!). 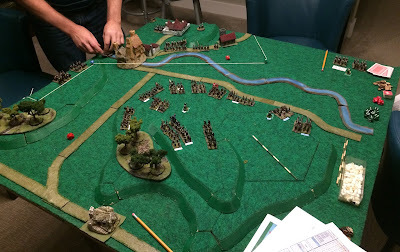 Bruce hosted me on Tuesday in game of Fate of Battle: Look Sarge, No Charts! 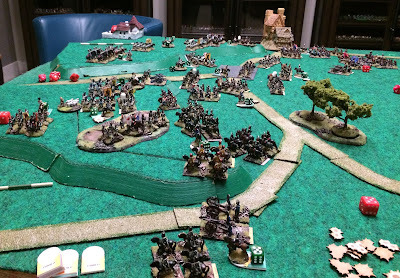 Napoleon's (whew!) by Buck Surdu (and someone else whose name escapes me). I'm sure we've played this system once before. 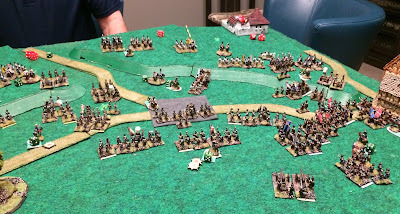 The crux is that there are no charts, just rosters and some custom dice (which Bruce converted back into a chart because it is easier to deal with...). 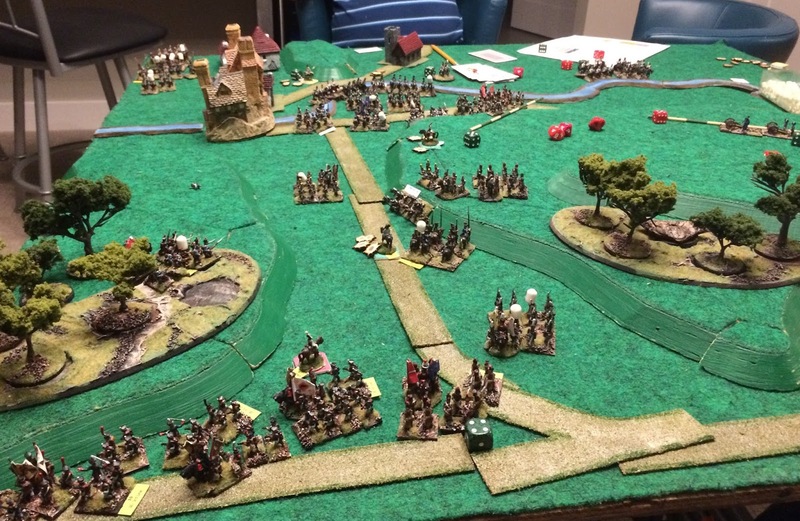 The French set up on the hill (bottom centre) and their objective was to last 12 turns. The Russians set up on top left (white string denoted boundary) but then also had reinforcements appearing on the left and top right during the game. Bruce managed to stick himself good with a push tack at the beginning of the game (looked bad!) but bravely soldiered on. Activation is card driven and turns end randomly so not every brigade gets to move every turn (although likely they get at least one move). My "plan" was to spoil Bruce's cavalry attack so I surged left off the hill. 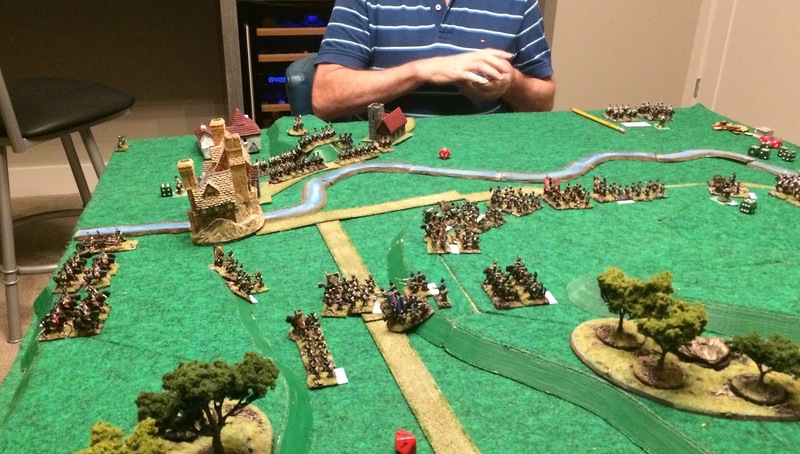 This was a so-so strategy, salvaged by good dice rolling. Meh, first time out with these rules so a guy is gonna make some mistakes. In the end, I owned the hill and turn to face Bruce's main force (eventually bagging his cannon, but it took forever!). He then moved across the river at me and my infantry went into square. The problem with that strategy was that his reinforcements started to arrive behind me. 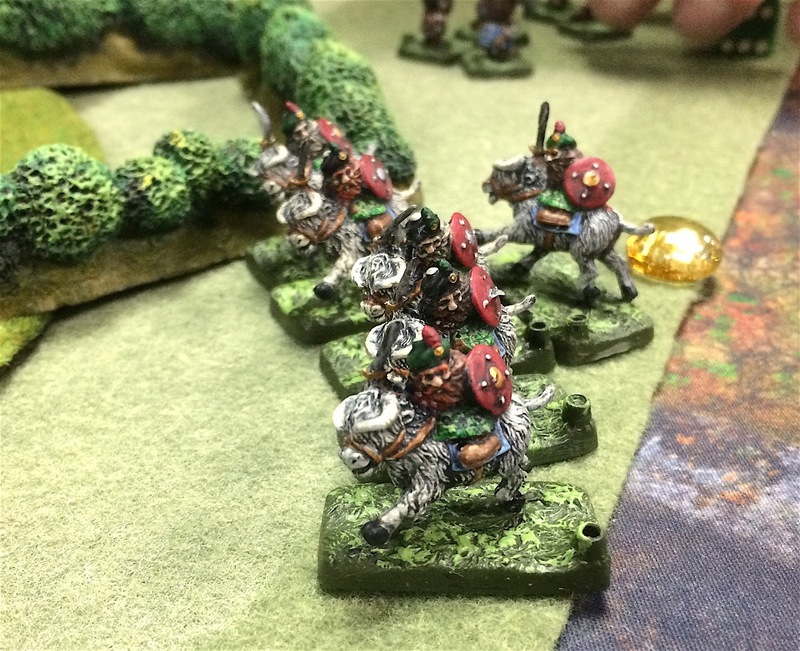 The first group were cossack horse whom I dispatched with more lucky dice. 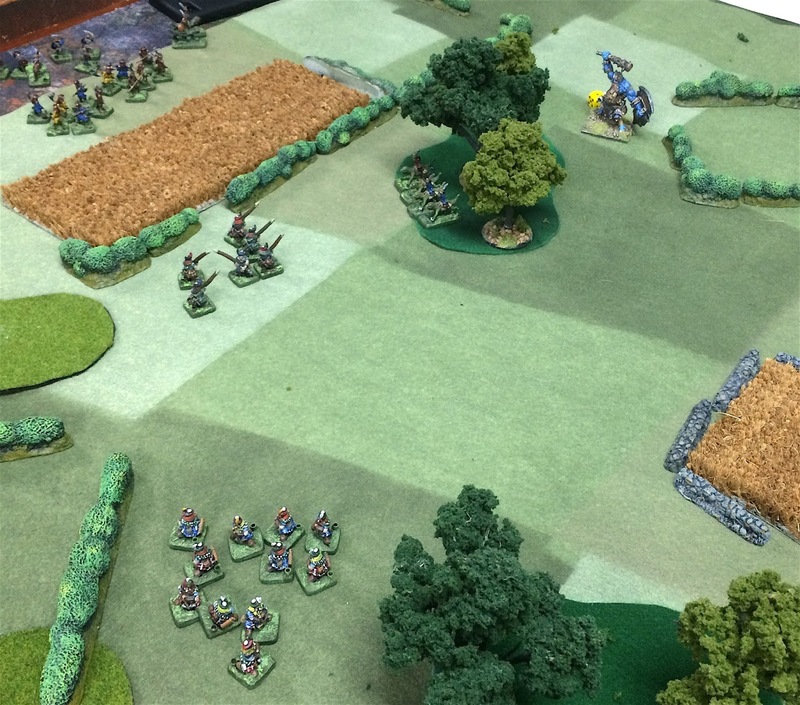 But they then gave way to infantry which crashed into my squares. This kind of pin-and-wail strategy was pretty effective except for... more lucky dice. Without them, I was hosed at this point. Things were heating up in near the river and Bruce had routed my weaker command. His horse were working their way around my flanks (out of picture below on right). But square is pretty tough against cavalry. 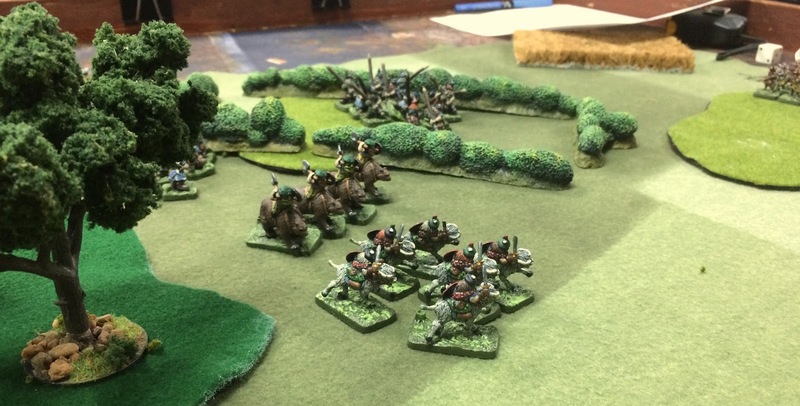 Fortunately, I managed to rout his infantry who were creeping over the hill. He could have recovered them but likely without enough time to get back in the game. 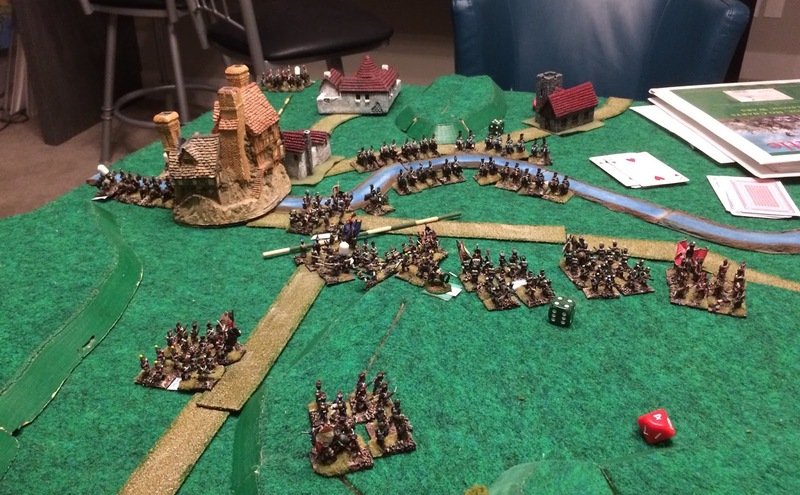 So we called it as a lucky win for the French (who were "rewarded" by being allowed to continue their retreat from Moscow...). Pretty slick rules (much like Surdu's PT boat rules that Justin has). Your focus is at the command level, the mechanics are easy to remember and use. There is enough grit when closing to melee that the game feels like Napoleonics. 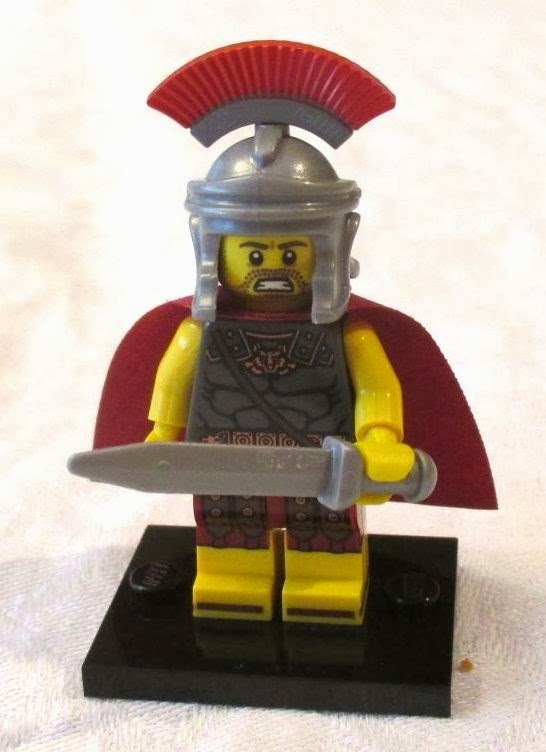 But there is none of the turgidity that most Napoleonic rules seem to contain. I'd play again! Which is good because Bruce is (gasp!) 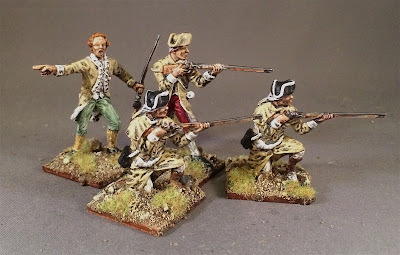 rebasing.